Fleet is comprised of various types and lengths of luxury yachts ranging from 40’ to over 100’ in order to provide you with as many options possible so to best meet your needs. To see our luxury yachts, please click the link below. The Cayman’s are surrounded by picturesque islands and scuba destinations for you to visit while in the Cayman Islands. For a brief overview of some of these locations and what they have to offer, click on the more info link below. There are many events and occasions that go hand in hand with chartering the yacht of your choice. We have provided a list along with some pictures of the more common occasions and events for your perusal in the link below. Welcome to Yachts Cayman! We are the Yacht Charter Expert specializing in all luxury yachting activities in Cayman. At Yachts Caymans, we all share a genuine passion and love for the sea, and strongly believe that a luxury yacht charter is the best way to truly see and experience the tropical island paradise of the Cayman Islands. Whether you want to sail the crystal clear waters of the Cayman, snorkel coral reefs teeming with marine life, have a romantic dinner cruise with your special someone, or enjoy a day or evening cruise with your family on board your own private yacht, we offer the best options in yacht charters at the best value, tailored to just what you want. Travel in style, and go wherever the winds take you on board your own private yacht charter. Our high-quality yachts are truly a five-star floating luxury resort with sophisticated & luxurious interiors and all the modern amenities & water sports equipment combined together with our unmatched customer service to provide each and every guest with an unforgettable experience. You can choose from our large selection of luxury yacht rentals, including Motor Yachts, Power Yachts, Sailing Yachts, Catamarans, Megayachts and Superyachts, that typically range from 40 feet and exceed 120 feet. Although the model, size and style of each of our luxury yachts are different, you'll always get the same quality & professional service aboard your chartered vessel. For more information about the yachts that are available for charter, please browse our 'Luxury Yachts' Page. From the first time you contact us to the time your yachting excursion ends, our only aim is to ensure that your charter vacation on our luxury yacht is full of lasting memories, fun, adventure and entertainment! From a 4-hour yacht charter to extended stay charters, just let us know what you would like to include into your vacation, and we will match your needs with the perfect yacht and crew guaranteed to exceed your expectations. 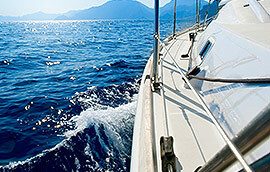 Chartering your own private yacht with Yachts Caymans is very simple, easy and convenient. Once you provide us with your bucket list of requirements regarding charter service via email or phone, our experts will immediately contact you to give you all the information needed to make an informed charter selection. One of the best parts of planning a yachting vacation is selecting your destination. Cayman archipelago comprises of three islands – Grand Cayman, Cayman Brac and Little Cayman – each has its own unique charm and attractions. Whether you want to enjoy a laid-back vacation on one of the pristine beaches of Cayman or looking for something more adventurous, our experts will match your desires and specific needs with the climate, amenities, cuisine and places of interest of your best Cayman destination. All types of special events and occasions are welcome at Yachts Caymans. From the finest luxury yachts to the specialized service, we offer the ideal setting for weddings, birthday parties, corporate events, bachelor/bachelorette parties, sunset cruises, fun cruises, and the list goes on. Wine, dine and and entertain on your very own private yacht. You simply provide a wish list of events and places, and we help you create an itinerary for your own custom cruise. We have the best chefs & caterers, experienced event planners, professional photographers and world-class entertainers to help you create unforgettable memories of your trip. If you need some ideas or suggestions, give us a call, email or click on the Contacts link provided here because we love to help our clients plan a truly memorable Cayman excursion. Click on the links to find out more about our Destinations Locations and the different Occasions & Events. The cost of chartering any yacht depends on the type and size of the vessel and individual needs. Yacht charter prices also vary according to season; peak season prices are often higher than off-season prices. Chartering cost varies with the length of the vessel as the crew requirement changes in proportion to the yacht length. Other things to consider when chartering a yacht are the number of guests who will be in attendance on the charter and the type of water sports activities you want to enjoy. Once you provide us with your specific requirements via email or phone, we will send you a personalized and detailed quote of your charter based on your needs and desires. To request more information on chartering your own private yacht click the Contacts. We are glad to offer you a huge selection of the world's finest yachts at the best available prices in all charter locations and destinations of the Cayman Islands. From Mega Yachts with crewed charters, sailing boats, power yachts to luxury crewed yachts, we offer a wide range of yacht charters from a top quality and experienced crew. Booking our charter services is simple and easy. You can send your queries related to the yacht of interest as well as other specifics, and we will provide you with the necessary information to make an informed decision. Step 1: Choose your Yacht: Browse our fleet of Luxury Yachts to find the yacht charter that perfectly suits your vacation needs. You can consult our charter experts for help with your charter yacht selection. You can also contact us to ask about charter availability, price fand the type of charter that meets your specific requirements. Step 2: Provide A List of Your Requirements: Fill our preference sheet and customize your charter itinerary. Step 3: Get a Quote: Once the yacht charter requirements and dates are finalized, we will send you a detailed quote and Charter Contract. Step 4: Book your charter: An initial deposit is made to get the yacht reserved for the chartered dates. The booking is complete once the initial deposit is made. Step 5: Sail and Enjoy: Show up, sit back, relax and enjoy your vacation! Your satisfaction is our pleasure. If you need to contact us for any reason concerning charter booking, simply fill out the Contact Form by clicking here and one of our team members will get back to you as soon as possible.